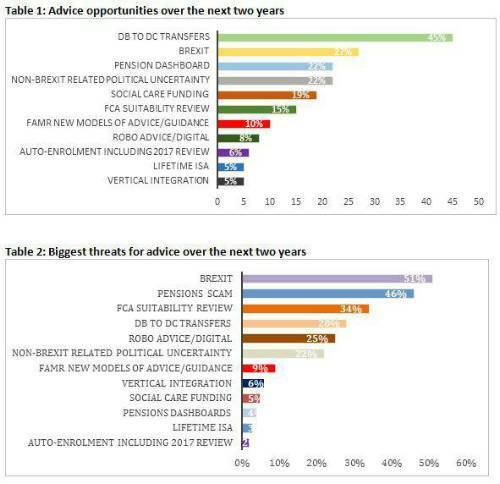 Latest adviser research by Aegon shows Brexit topping the threats while also offering opportunities, while DB to DC transfers remain the biggest opportunity to the advice industry over the next two years. Aegon research found that advisers see Brexit as the biggest threat to the advice sector, chosen by just over one half (51%) of those surveyed. However it also scores high on the opportunities list. Over a quarter (27%) of advisers viewed Brexit as a key opportunity, with another 22% viewing non-Brexit political uncertainty as an opportunity. For the second year running, DB to DC transfers tops the opportunities list with just under half (45%) of UK financial advisers viewing this as a key area for growth. This comes despite some commentators speculating that the transfer market may have peaked and as the FCA’s new guidelines on transfer advice begin to bed in. Disappointingly, new models of advice or guidance from the Financial Advice Market Review were seen as an opportunity by only 10% of advisers, suggesting FAMR has not yet delivered to its potential. This raises the stakes for the FCA’s promised 2019 review of FAMR and the Retail Distribution Review. The research showed pension scams were also considered a significant threat to the industry with just under a half (46%) of advisers worried about this issue. The recent implementation of the cold calling ban should hopefully reduce these concerns going forward.